These beautiful battle cruisers, HMS REPULSE and her sister RENOWN - both built incredibly quickly but nevertheless completed just too late to see action at Jutland - clearly caught the eye of Langmaid in a big way for he executed several etchings and watercolours of the two at various stages in their careers and even an oil painting or two as well (see under HMS REPULSE in Maritime Prints (www.maritimeprints.com)). 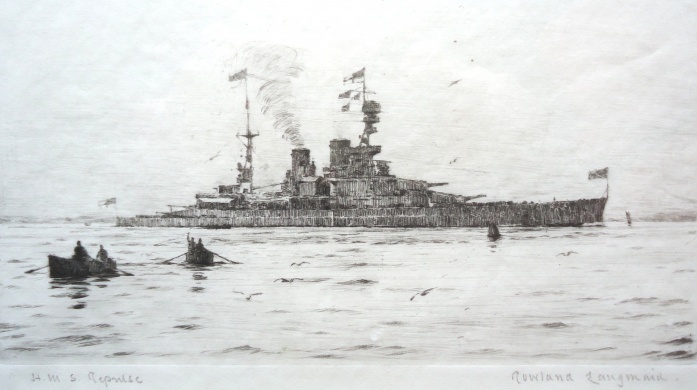 This etching of REPULSE shows her with a Royal Standard at the mainmast, almost certainly HRH The Duke of York's (later HM King George VI) as were it The Prince of Wales who was embarked - and they both took passage in REPULSE several times in the 1920s - the Trinity House jack and not the white ensign would have been flying from the foremast (and see the watercolour of REPULSE wearing that jack) on this website. REPULSE, of course, met her end in December 1941 when three days after the attack on Pearl Harbour, Force Z, under Admiral Sir Tom Phillips and consisting of HMS PRINCE of WALES (Flag) (Captain J C Leach MVO DSO) and REPULSE (Captain W G Tennant CB MVO and who had served in REPULSE as Navigating Officer during a Royal Tour of 1924-25) was attacked and sunk by the Japanese in the South China Sea off Malaya's east coast. The 25 year old REPULSE under Captain Tennant's superb handling gave an excellent account of herself however and at speed and under alternating helm she avoided and brushed off several skillful attacks by torpedo bombers until four hit her from opposite sides almost simultaneously. From 25 knots she slowed to 15 and only minutes later with her four massive propellors still spinning, she capsized and quickly sank. John Leach went down with his admiral, Bill Tennant was picked up and went on to become a vice admiral in the late 1940s. Forty one years after PRINCE of WALES went down it was John Leach's son, Sir Henry, who as First Sea Lord in 1982, famously told Margaret Thatcher that he could assemble a naval task force over the weekend which would be ready to sail and regain the Falkland Islands if necessary. He did - and it did.